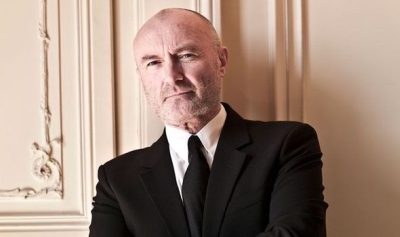 Phil Collins has officially come out of retirement, announcing five shows at London’s Royal Albert Hall, but it seems like a solo comeback may not be the only thing on the cards. “Writing the book reminded me how close we were,” he says, talking about his new autobiography Not Dead Yet. Despite the optimism, Collins is still wary about agreeing to too many things straight off the bat. Particularly because he only just recovered from major back surgery this year. The muso has been rehearsing for his solo comeback since May, but he’s still not in a position where he’s as comfortable on the drums as he used to be. “When I hold a pair of sticks now, it doesn’t seem natural. Most of my playing now is done from fingers, not grip. That’s what I’ve lost,” he says, adding that he’d need to be an able drummer again to consider a Genesis reunion with former frontman Peter Gabriel, which would make Collins the drummer once again. “If I was an able drummer I’d gladly get behind the kit and drum for Pete,” he says. There are no “plans” just yet for a Genesis reunion, but Collins does seem open to the idea of a tour where his 15-year-old son Nicholas plays drums and Collins himself sings back-up for Gabriel and also plays light percussion. The last time Collins toured with Genesis, albeit without Gabriel, was back in 2007 on the ‘Turn It On Again’ Tour. Obviously, his focus right now is on his own solo tour, which will start in June 2017.